On November 18, 2016, members of the HSBP were treated to a behind the scenes tour of Blue Note Hawaii and open discussion with General Manager, Marco Olivari. Mr. Olivari managed the Blue Note Jazz Club in New York City before arriving in Hawaii to open this exciting new entertainment venue in Waikiki. Mr. Olivari shared the history of the Blue Note and what the clubs offer both audiences and artists around the world. Blue Note Hawaii was founded by Danny Bensusan. It is a family business and is growing. Their goal is to offer an intimate jazz club setting, equipped with the latest in music technology. The showroom provides a personal and professional setting for entertainers and the audience, gives audiences the opportunity to experience the music and artistry of acclaimed international and local artists all while enjoying wonderful food and beverages. Blue Note Hawaii’s showroom is located at the OutriggerWaikiki Hotel. It is 3-tiered consisting of a bar , and plentiful booth and table seating allowing patrons to enjoy great dining. Our HSBP attendees received a double perk with the opportunity to participate in a back-of-the-house and showroom tour, as well as an evening of entertainment featuring internationally acclaimed entertainer, Peter Cincotti! Oh, and not to mention, dinner and “spirits”! According to the attendees, Blue Note’s investment in the showroom’s sound and lighting, and the ambiance of the showroom, resulted in an amazing “true jazz club” experience! For those interested in an upcoming show, visit www.bluenotehawaii.com for information on the entertainment lineup, ticket prices and show times. Note that kamaainas receive a 15% discount. On October 20, 2016, an intimate group of HSBP members had the very exclusive opportunity to visit the NOAA (National Oceanic and Atmospheric Administration) facilities on Ford Island. After a thorough security clearance check and an okay to proceed through the gate onto the island, we were provided with a very informative tour conducted by staff members, Matt Ramsey and Patty Miller. The tour started with a demonstration of their "Science On a Sphere (SOS)" global display system that uses computers and video projectors to display planetary data onto a six foot diameter sphere, analogous to a giant animated globe. It is an educational tool to help illustrate Earth System science to people of all ages. Animated images of atmospheric storms, climate change, and ocean temperature can be shown on the sphere to explain complex environmental processes. They were even able to show us where sea turtles were in parts of the ocean that they were observing as one of their many research initiatives! *The auditorium's air conditioned using cold seawater from a 1500 foot deep well that brings the cold water up, one of many ways in which the NOAA facility promotes a "very green" building. *NOAA is limited to installation of solar panels as it is a historic property. *Noah's work includes exploring our oceans, managing our fisheries, charting our waterways, understanding our climate, conserving our maritime heritage, deepening our knowledge of the Pacific, Atlantic, Indian and Arctic oceans. *NOAA falls under the U.S. Department of Commerce and under NOAA falls the National Marine Fisheries Service (protects our ocean resources and their habitats), National Ocean Service (helped to remove the humpback whale from being on our endangered species list), National Weather Service (provides weather, water and climate data, forecasts and warnings to protect life and property), National Environmental Satellite Data and Info Service, Office of Marine & Aviation Operators (conducts marine debris cleanups and deep water explorations) and Office of Oceanic and Atmospheric Research. Other areas of the NOAA facility that we were able to tour were the laboratory in which research is conducted on the animal life found in our waters, the Pacific Tsunami Warning Center in which we learned about DART sensors, Coastal Sea Level Gauges and Seismic Stations that are all placed strategically around our earth to enable detection of a potential tsunami impact to the Hawaiian Islands. Did you know that there are two staff members at all times monitoring this center and at least one cannot be sleeping! 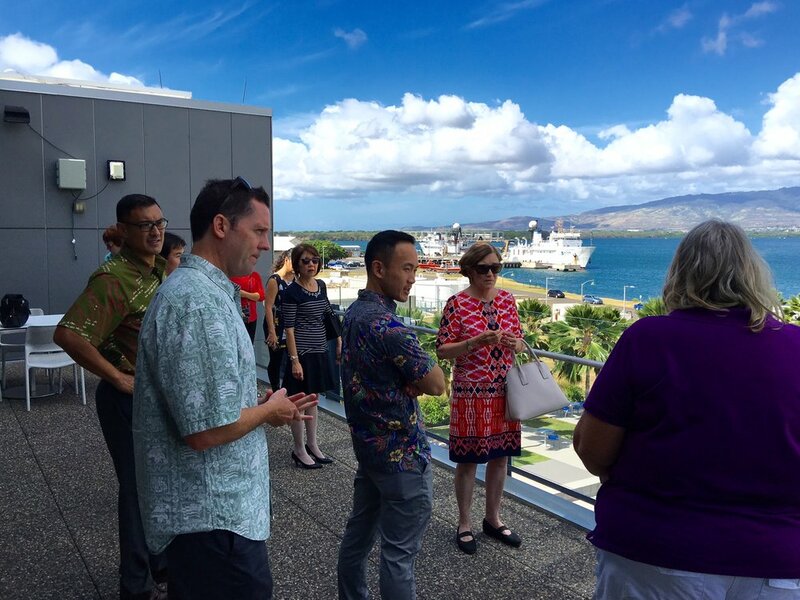 Our tour ended with a beautiful view of Pearl Harbor from the outside lanai of the NOAA facility and an opportunity to network with each other at one of the staffs' most favorite places - the cafeteria! Anyone interested in booking a tour of the NOAA facility is welcome to contact Matt Ramsey at (808) 223-4404. · UH also has $5.2M of additional costs, unique to Hawaii (simply due to our location), that other schools do not have and if not for the unique costs, for example, UH would have had a “surplus” in budget rather than a deficit in 2014. · UH falls short in generating revenues in 3 of 14 revenue categories – student fees, governmental support, and contributions. Otherwise, UH is above or comparable to its peers in the other 11 categories. As such, Dave Matlin, shared his 5-year financial plan to reduce deficits and meet Athletics’ future competitive needs, shooting for a target year of 2020. The focus of his plan is to create partnerships that would help sustain the athletics program and improve tickets sales. One of the biggest successes achieved this year was the approval from the legislature to allocate $2.7M to UH Athletics for operational needs in 2017. These monies will primarily be used to redesign two gyms, the Wahine Softball Stadium, and refurbish the Les Murakami Baseball Stadium’s locker room. One of the biggest challenge nationwide for college athletics is that millennials are not coming out to games anymore because of their “virtual lives”. UH supports 21 different sports, something a majority of other colleges do not. The current average GPA of the UH student athletes is higher than the UH’s entire student body. Our day was ended with a great tour of the UH Athletics training academy, wellness center, student athletes’ gym facilities and a back-of-house/underground tour of the Stan Sheriff Center. It was definitely an exclusive opportunity, which everyone enjoyed! 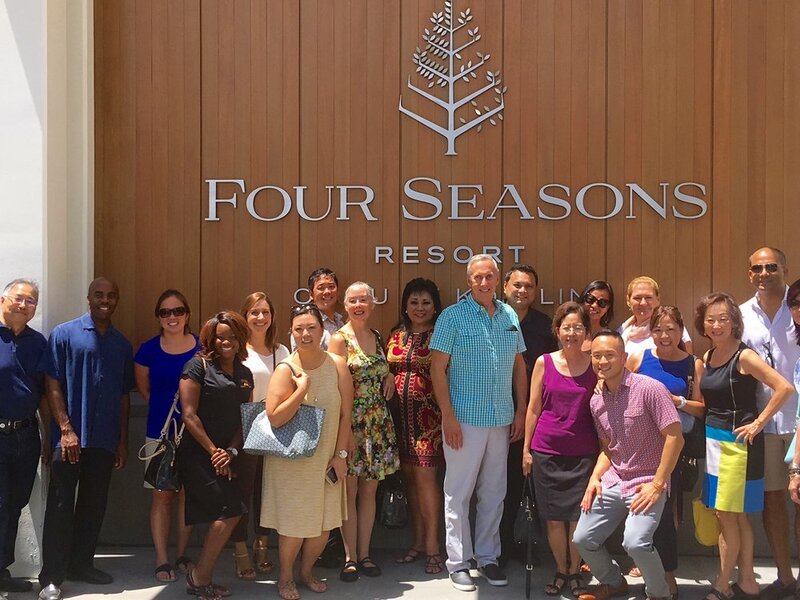 On Saturday, August 27th, our HSBP members were treated to a great property tour of the newly opened Four Seasons at Ko'olina. General Manager, Sanjiv Hullagalle, and his team did a terrific job from start to end. Our group was welcomed at their Oysters and Bubbles Lounge to a delightful spread of treats from fruit-infused mimosas, to smoothies, pastries, sushi, and wonderful delicacies created by their talented catering team. 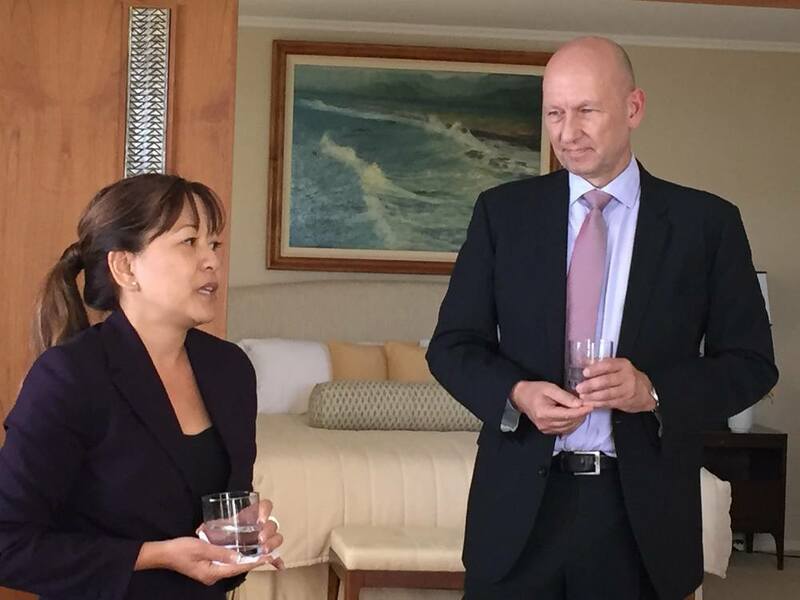 Mr. Hullagalle addressed the group, along with his Resort Manager, Mr. Phil Clough, on the Four Seasons culture; its luxury service standards and embracing the local community to help create a magical experience for guests; their employees and the residents of West Oahu. We learned that during the hiring process, there were 20,000 applications received to fill 700 positions. Imagine that. Additionally, we learned that the hotel has created special opportunities for guests to enjoy local activity such as fishing with the kama'ainas, and gets involved in community service projects such as cleaning up the coastline. The welcome address was conducted all while enjoying the scene overlooking the hotel's beautiful ocean view and lagoon. Already impressed with the welcome, the group was led throughout the hotel to rooms ranging from $950 - $17,000 per night penthouse. 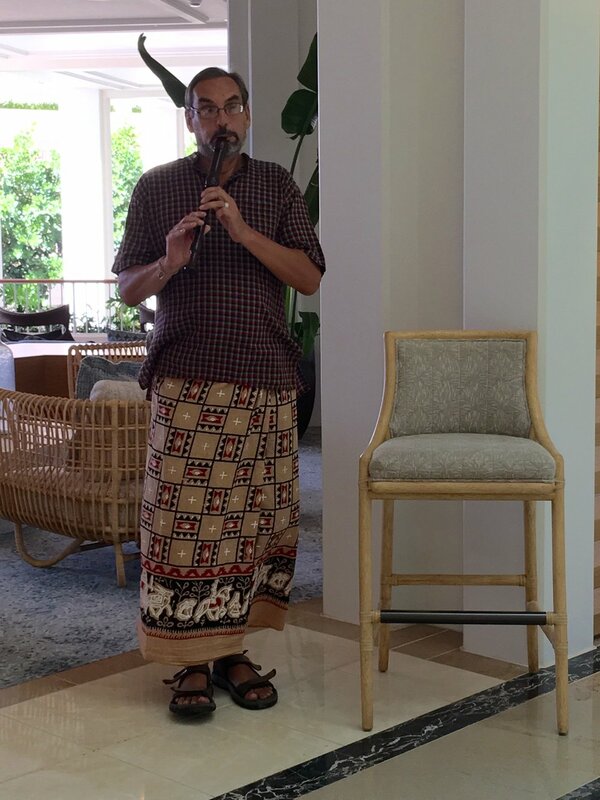 We walked through the lobby where a local resident from Waianae was performing beautiful music on a unique instrument. We got in some sun as we checked out the various pool decks, roamed through the beautifully-designed restaurants, and one of our members even snuck in a photo opp with a celebrity guest staying in-house (shhhh, can't mention who)! The Four Seasons at Ko'olina truly shined in their hospitality and our HSBP members left with a memorable experience. Founded in 1979, Armstrong Produce has grown from a small family-run wholesale business into Hawaii’s leading produce wholesaler and distributor. With locations in Honolulu, Kona & Kahului, Armstrong Produce supplies a wide range of customers, from local chefs to big box retailers, with fresh produce every day. Armstrong Produce is committed to sourcing the freshest produce at the best prices. The company prides itself on having built a network of partners that procure produce from around the world. Once the produce arrives in their facilities, they uphold the highest food safety standards to ensure that safe, high-quality produce is delivered to customers. Looking back at 80 years in the produce business, starting at the family farm in the 1920s, the company understands the importance of supporting local growers. Local farmers are an integral part of Hawaii’s community, economy and food supply, and the company is pleased to source fruits and vegetables from over 100 local farmers across the state. Our hostess for this visit was Tisha Uyehara, the Director of Marketing and Food Safety. The February 2016 cover story for the Hawaii Business Magazine featured, “Creativity as Hawaii’s Next Big Export” and the 6 accelerator/innovation programs run by Creative Industries in six basic areas, including: screenwriting, broadband content for the web, interactive media, fashion and couture design, production and music. Georja Skinner, the head of the Creative Industries Accelerator and Innovation program, spoke to HSBP about how Creative Industries was the fastest growing segment of the Hawaii economy. Using the accelerator model, Creative Industries puts together panel and keynote workshops in the six basic areas. This month the focus is on screenwriting. The screenwriting immersion program starts with the workshops and bootcamp. HSBP members learned about a successful participant in the 2013 program who went from an idea to a script and finally to production of a film that was entered into the 2016 Academy Awards under the Best Foreign Films Category, Josh Kim’s “How to Win at Checkers Every Time”. Members of the HSBP group were also invited to attend an evening presentation on Friday by the woman screenwriter for Pixar’s “Inside Out”. November’s Boardroom ventured into the field of couture and the fashion design industry. The two principals at the “Cut Collective” fashion incubator , Alison Izu Song and Summer Shiigi, spoke about the diverse business aspects of operating as a factory hybrid for the fashion designer industry. This is Hawaii’s fashion incubator which also functions as a factory hybrid dedicated to providing independent designers with the resources and skills to streamline their production process, transforming local manufacturing into the most innovative and affordable process, while providing a design-driven option for the local consumer. It was fascinating to learn about the mentoring process for the 11 designers who went through the innovation workshop and to hear about how it is possible to design, cut and produce garments in Hawaii. The “Gerber” system of placement of the pieces of the design on the fabric for cutting was intriguing. It was also interesting to learn that the Gerber system allows designs to be sent on the internet to the production facility. Their perspective on the fashion industry is unique and really provided the HSBP members with a view of the fashion and design industry from the designer’s and producer’s perspective. Alison is the owner and design force behind Alison Izu Denim which focuses on clothing for petite women and is featured at Nordstrom and carried nationally at jeans.com. Recently Alison’s design was on the cover of the November 2015 “Honolulu” magazine for the fashion week coverage. Summer has over 12 years of experience in retail and buying and is the contributing editor for “Honolulu” magazine. Summer has the Ten Tomorrow line of ready-to-wear fashion. Their presentation clearly articulated how vital it is to the people of Hawaii to support and nurture the Cut Collective and the fashion designers. HSBP members tour the Shidler facility. Eleven members of HSBP experienced a fantastic tour of the Shriners Hospital on October 14th. The tour started with a warm welcome in the lobby of the main building where staff member, Angela Keen, shared the interesting history of the hospital with our group. Shriners Hospital was a home owned by the Dowsett family who chose to donate it to the community for use as a hospital. It was originally located in Kuakini and later relocated to its current location on Punahou Street. In 2008, the hospital was renovated and two additional buildings were built – the Administration Building and the Family Center. Our members learned that Shriners is a fraternity supporting philanthropic causes. Honolulu is Shriners’ second orthopedic hospital, following the first one built in Louisiana in 1922. The most amazing part of the tour was a visit to the orthotics and prosthetics area. We watched how carefully precisioned and compassionately made the customized prosthetics were built for the young patients. Thoughtful details such as the ability for the children to choose a fun pattern for their back braces are all taken into account to ensure successful healing and quality of life. The tour ended with the opportunity to meet Zeke Schmus, Chairman of the Board for Shriners Hospital, who shared additional interesting facts including a recent private donation that the hospital received in the amount of $8 million! We were fortunate to meet Zeke, a Shriner who has devoted most of his life to volunteer work. The tour of Shriners Hospital was truly a wonderful experience for everyone! 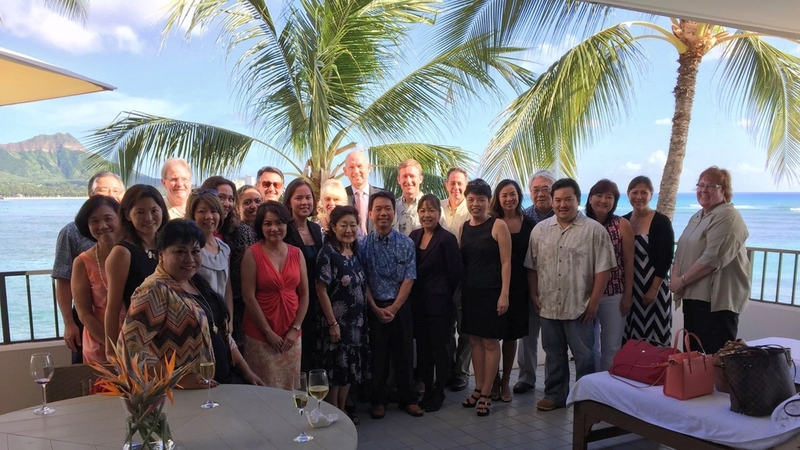 HSBP board members enjoyed conversation and refreshments with Halekulani CEO Peter Shaindlin, who also spoke on the company’s mission and future plans at a members-only Boardroom Series event. 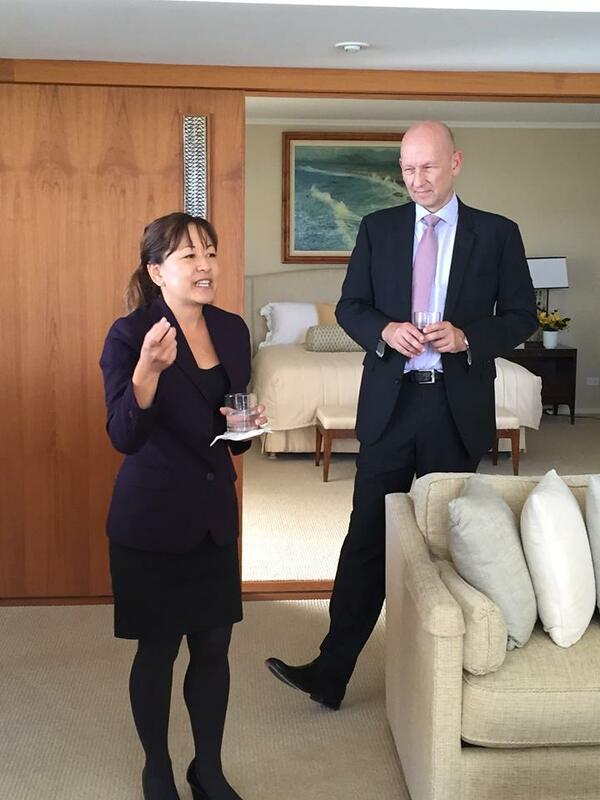 The event included a tour of the property ,including the exclusive Vera Wang suite. 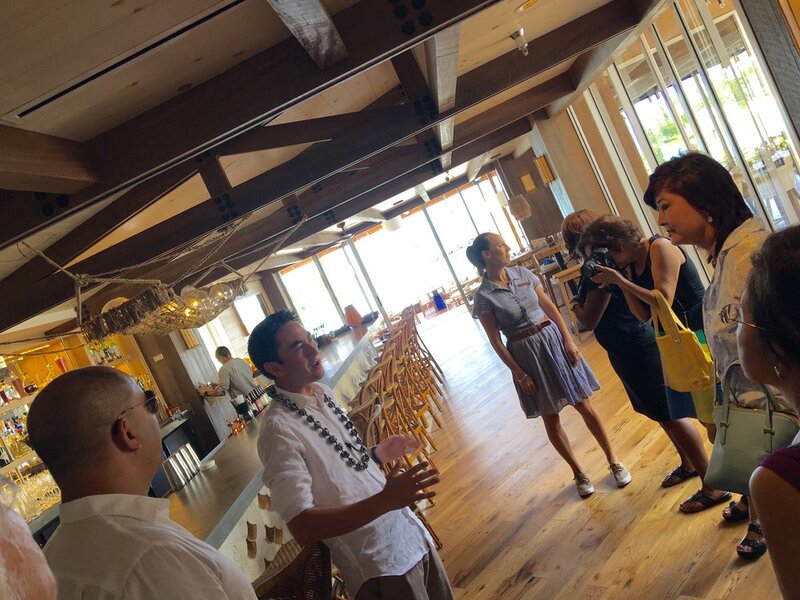 On August 14, 2015, 12 HSBP members attended a Boardroom visit at Hawaii Pacific University’s (HPU) Waterfront Lofts at Aloha Tower Marketplace. We were greeted by Marites McKee, Dean of Students for the Department of Student Life who took us on a tour of the property. HPU is putting the final touches on the $50 million renovation. Fifty percent of the Aloha Tower Marketplace will be HPU’s property and the rest will be Aloha Towers. The Hawaii Pacific University facility will house 74 dormitory units located on the second floor which will house 278 students. The units include lofts with single, double and triple occupancy rooms and studios with double occupancy rooms. On the ground floor, students will have access to facilities including the Book Store, Learning Commons, Faculty-Student Lounge, and multi-purpose rooms and HPU offices such as the Welcome Center, Student Life, Waterfront Lofts Housing, Student Government Association, and Campus Activities Board; and various retail and dining options. HSBP members toured all of these areas and were impressed by the large amount of space available to the students. And the beautiful ocean and mountain views were impressive. Not a student? You can still enjoy the property. The multi-purpose rooms are available for rent to the public and the dining area can also be used for private events. On Wednesday July 22, HSBP was treated to a tour of The Patisserie in Pearl City Industrial Park. Bob and Colleen Paparelli were our hosts and gave everyone a brief introduction of their lives and the journal that brought them to Hawaii. Like most business owners, their road had a few bumps in it, including Bob’s being laid off his first job in Hawaii with Holsum Bakery. They knew they wanted to stay in the Islands and started looking around for a new job. A colleague introduced him to the prior owner of The Patisserie, the only problem was that they did not have any savings for a down payment. As Colleen put it, “really, nothing!”. Circumstances favor them with a bank and a seller that understood the experience they brought to the table and allowed them to assume the notes and take over. Initially in Makiki, they moved into a larger location on Ualena in the airport area, and by June 2013 were able to grow enough to buy their current location (27,000 square foot) in Pearl. The company has grown to over 70 employees, working 24/7/365 to bring fresh bread, pastries and cakes to some of Hawaii’s largest hotels, convenience store chains, restaurants, grocery stores, big box resellers, and the military. All the growth was achieved without any marketing, all through referrals and word of mouth. Unfortunately, due to a gravel spill, there was a terrible traffic jam and several attendees turned around. Left a dedicated group to enjoy the samplings! On May 6, 2015 - 26 HSBP members attended a boardroom at Y. Hata & Co.‘s newly opened cash-and-carry wholesale club called ChefZone. Five years ago, ChefZone was merely an idea to help small restaurants get what they needed, when they needed it. Today, ChefZone is the culmination of that idea. It is Hawaii’s first one-stop cash & carry wholesale club designed specifically for Hawaii’s foodservice businesses. With over 6,000 products including fresh meats, produce, dairy, dry goods, beverages, baked goods, Asian/ethnic, disposables, smallwares, tabletop, and cleaning supplies, ChefZone aims to reduce the number of supply stops for customers while helping them to increase their profitability. Our host was Christopher S. Lee, Director of their Cash & Carry Division. Chris explained that the “Entrée-preneurship Center” focuses on helping new restaurants and other small food business operations. They are able to help them with their Business Plans, Human Resources, IT, Accounting as well as Graphics and Design and Social Media. They are able to walk them through everyday challenges and help them find solutions. We also took a tour of their 45,000 square feet of dry, chill, and frozen space facility. Including the “Chill Zone”. A large chilled room which houses a variety of ready to use products. Many of which are used in many local stores and restaurants. At the end of our tour each member received an “Ohana Membership Card” and did a little shopping. “The chocolate is fantastic and Menehune Mac makes their candies by hand!” The sold-out Boardroom for Menehune Mac gave the HSBP members insight into an original Hawaii manufacturing company that is able to stay profitable in the age of mechanized chocolates. The lucky HSBP members were able to make their own box of wrapped chocolates and to learn to pour and mix chocolates with mac nuts. 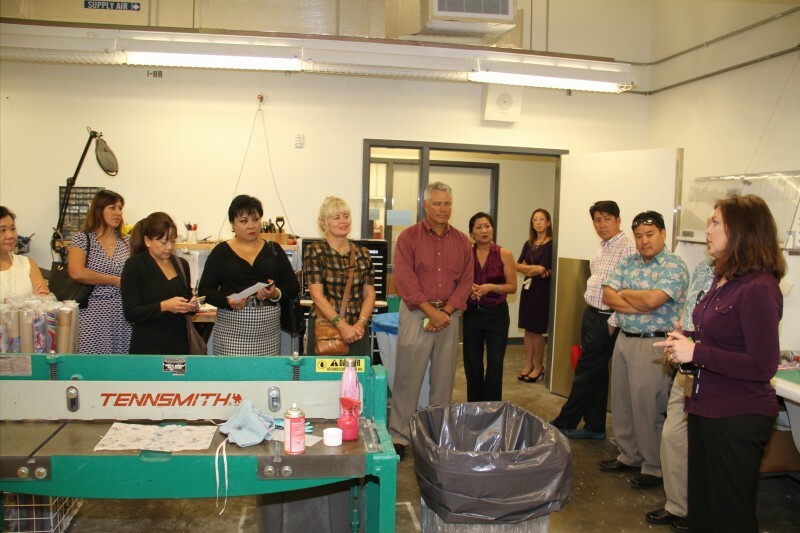 Then HSBP members were led on a tour of the factory by Menehune Mac President Neal Arakaki. The 35,000 sq ft building is staffed by experienced chocolate makers making the chocolates “by hand”. We were able to see the mac nut candies from its start – as a ten pound bar of Guittard chocolate, through the heating process and tempering process right through boxing the chocolates. Menehune Mac’s President described how his mac nuts and chocolates use the best chocolate available and nuts from the Big Island. Tempering is a tricky process and the next time you eat a chocolate that scratches the back of your throat you will know that the tempering was done too quickly, so that large sugar crystals formed. No large sugar crystals in the delicious Menhune Mac products! Packaging also is specialized and the only mechanized process at the factory. Menehune Mac was the first in Hawaii to use the packaging system developed in Japan and utilizing plastic wrap used in medical facilities and hospitals! 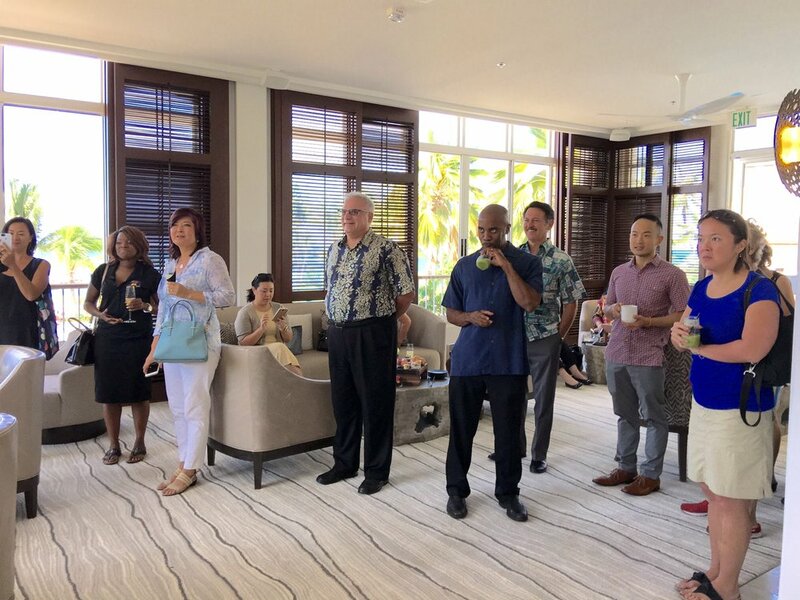 Touring the showroom, HSBP members were able to purchase the delicious chocolates and to also purchase some of Menehune Mac’s newest products, like Liliikoi Bars, that are only carried by Neiman Marcus.